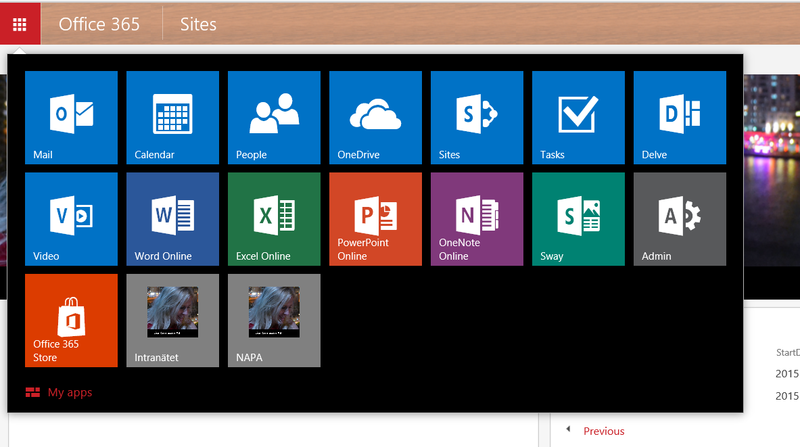 Then open the Office365 Admin center and create a new Private Site collection using the template “Development Site”. 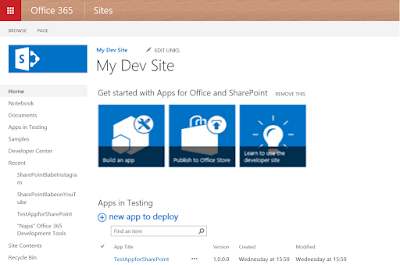 Click on the “Build an app” icon and select what type of App, sorry Add-in, you want to create and give it a name. The code editor of course has intellisense, and you can right click! 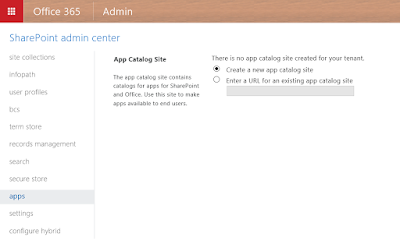 Not so common when it comes to SharePoint sites! 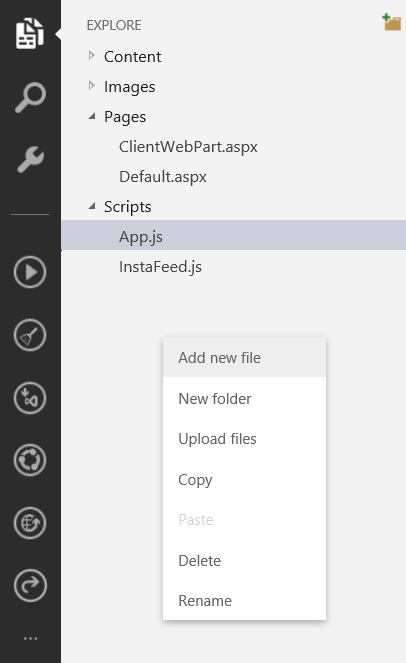 You can right click to create new files, upload files, etc. Sweet. 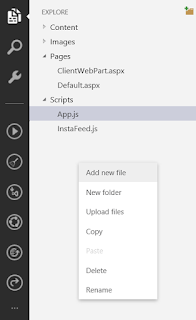 For me, as a non .NET developer, this tool is very useful because even I could quickly build a small app that displays all pictures tagged with “sharepointbabe” from Instagram. Cool right? Not many lines of code to get that. And then you can put CSS on it to make it look nicer, and so many more things to make it look good. And make it a web part so the user can add their own values. I will try to import my blog posts from this blog now. 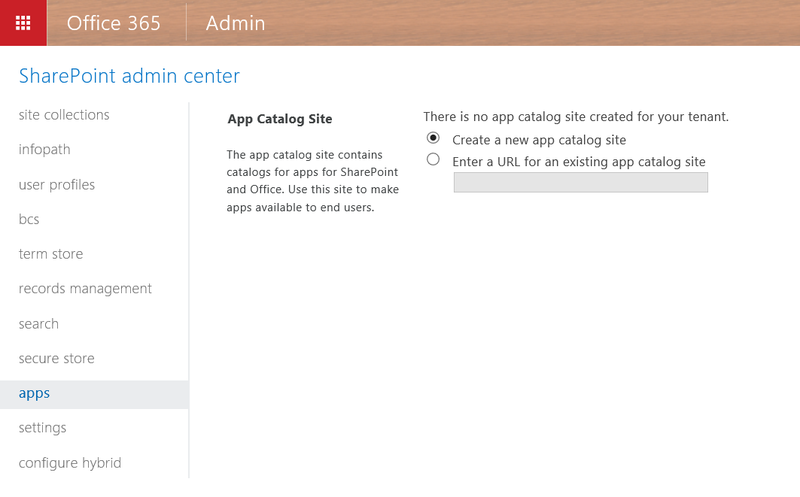 But I am missing something: the option to build InfoPath apps, add-ins, but I don’t think it is supported which is sad. It supports the common Office family of course like Excel, Word, PPT, Outlook, you can build task panes and contents and mail forms. You think you have found a perfect way to do something and it is like 90% satisfaction, but the last bit missing. Maybe it’s because Microsoft had planned to stop supporting InfoPath (and then changed their minds), but I think a LOT of companies uses InfoPath. And it is a brilliant, from-easy-to-super-complex, software, I love it! 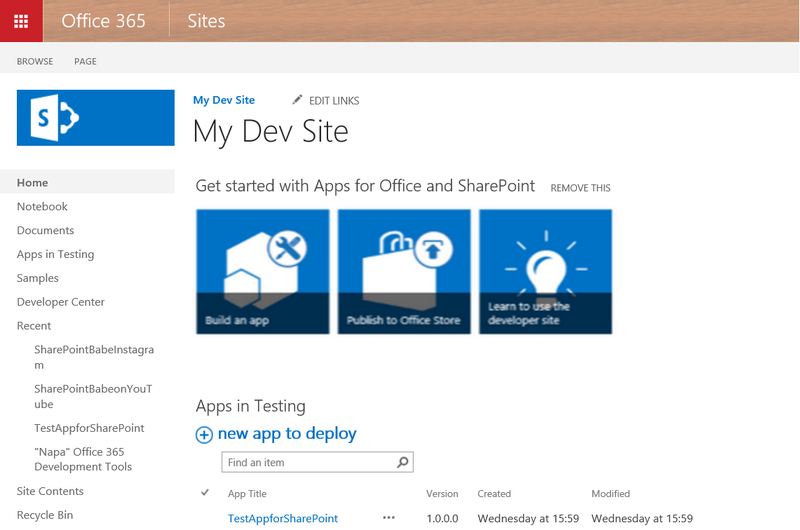 As you can tell from my many post blogs about InfoPath 🙂 But it’s just so smart with the Rules, you can add code, lookup info from SharePoint lists or other media, and you can design it to look really good. And you can import/export data. I mean, how useful isn’t InfoPath!! I have a few forms that I would like to package as add-ins but maybe I am thinking wrong, maybe that should be done in another way rather than from the app store. But for me, it would make most sense.